While I love my trellised blackberry bushes, I planted a couple erect (no trellis needed) blackberry bushes a few years ago. I researched different varietals and found that some contained more cancer-fighting antioxidants than others. The berries are smaller, and the seeds seem larger on a few of those I planted. Frankly, we eat so many of the larger, tastier fruit that I suspect the difference in the amount of antioxidants consumed is nil. Interestingly enough, due to the new, higher demand for these antioxidant-rich berries, there is a shortage of Ohio grown blackberries. The Ohio State Extension office has embarked on a two year study, $55,000 funded through the US Department of Agriculture, to figure out how our blackberry (and raspberry) farmers can improve yields. Much of the study is focused on season extending techniques, such as the use of high tunnels. The tunnels would protect the plants from harsh winter temperatures, but also from too much rain. Fruit yields improve with tunnel protection by preventing cold weather injury and fungus that often accompanies excessive rain. Sunlight can still reach the plants through the fabric used in the tunnel covers. Part of the study involves educating bramble farmers as to the benefits of using high tunnels and season extending techniques such as planting bushes that yield berries at different times of the season. The OSU group plans to increase berry fruit producing acreage by 150 acres and yield by 15%. I’m sure Ohio farmers can see the benefits of earning more money from their cash crops. I am pleased for their sake, and also for Ohio consumers who can reap the benefits of more locally produced berries. I am also exceedingly interested in the hardier varieties being tested. They may only benefit those producers in Northern Ohio, as my berry bushes seem to make it through our winters in SW Ohio just fine. However, I will keep an eye out in case even better varieties come of this study that I could use in my home garden. I look forward to the new knowledge that can increase the harvest, not only in local farmland, but also in my backyard. I love picking blackberries in my backyard every July. It is like our own private farm festival! I have learned to pick every two days, and just give the berries that look ripe a little tug to see if they come off the plant easily. Sometimes they look perfectly ripe, but still taste a little tart. If they don’t come off the plant with a little tug, I leave it alone for the next day or two. Those that do practically fall off into your hand are the sweetest, best tasting summer berry treat ever. The blackberries I grow are different than the blackberries Mom used to take me to pick. Those wild berries grew on thorny brambles in the woods. The berries then were a bit smaller than the ones I am able to grow today. We, alas, often brought a bit of poison ivy home with us in those days. However, it was totally worth it in blackberry cobbler! In spring about six years ago, my husband and I planted two thornless, trellising blackberry bushes. I carefully read and followed internet planting directions. Plant 3 feet apart and 8 feet in between rows. I planted our bushes in well drained soil 4 feet away from the chain link fence that separated my neighbor’s yard, plus 8 feet away from each other. They were such little tiny bushes in a great big garden plot! The following spring we planted two 8 foot pressure treated 4 x 4s, one on each end, in holes filled with gravel. We strung a heavy gauge wire through drilled holes in the end posts, one about 3 feet and the other five feet off the ground near the top of the wooden posts. We smiled at each other and looked forward to blackberries the following summer. Sure enough, the canes bloomed. We tied the canes to the trellising wire. They flowered beautifully and we enjoyed a couple quarts of great berries that year. New canes grew and I tied them to the trellis, too. The fun truly began in year four. Or should I say, the craziness? Internet pruning directions say to cut the tops off the new canes at 4 feet. I am a little slow, and some of those new canes grew to 15 feet long! I topped them at 8 and 10 feet to encourage the lateral growth. It felt like such a waste of the plant to top more than that. Berries came on fast and furious that year. The robins also came on fast and furious as well, and we invested in bird netting. We picked a couple quarts of berries every day for several weeks that year. I had a little trouble deciding where and when to tie the new canes to the trellis. There was just way too much bush for the trellis, not to mention the trouble in getting around the netting! Too close to the chain link fence, too. I could barely squeeze through in order to pick the berries on that side. I pruned the heck out of those canes to keep from crossing my neighbor’s boundaries and still had quarts and quarts and quarts of blackberries. The cobbler was very good that year. Every year my husband and I discuss “moving” the berries and every year the work involved and the idea of missing a year’s berry harvest defeats us and we deal with the craziness right where they were originally planted. To do it all over again, I would plant them 10 feet apart from each other and another 10 feet away from our fence! I don’t understand the pruning directions and spacing recommendations, though. Please note there is no sacrifice in the quality of the berries produced by letting them grow taller than recommended before topping, plus we get more berries. Perhaps it is due to the varieties involved. One of our plants is called “Chester” and the other is “Triple Crown”. Both bloom at the same time and yield identically large, tasty berries. Chester is perhaps a tad more frost resistant, but while a late spring frost once nipped Triple Crown’s leaves, its berry quality wasn’t impacted. 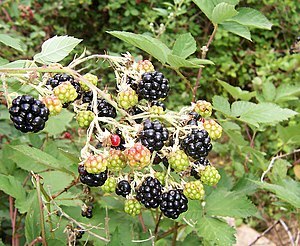 Blackberries have taught me how to farm in my backyard. I appreciate the lessons in maintaining the bushes with pruning, watering, fertilizing and composting the old canes. I appreciate learning to deal with hungry Robins and bird netting. I am pleased to be able to find the Ohio State Extension Office and internet resources, but also happy with what I have learned through trial and error. They have taught me how to handle a harvest as well. The first year we gave many quarts of fresh berries away to friends and neighbors. I learned to freeze some for limited winter use. Then I learned to can and processed beautiful jam jars to both give as gifts and enjoy summer blackberry taste all winter long. This year I am expanding even more on using the berries in different ways and look forward to our Christmas Blackberry Cordial. The blackberry bushes were my first foray into becoming less reliant on grocery stores. At first it was all about cobbler and the grocery store price of fresh berries. It has come to mean more about the possibilities in stepping out of food industry dependency. My neighbors and friends are also watching and learning, and a few of them are venturing into blackberry farming for themselves. I hope they enjoy the adventure as much as I have! I just finished reading my new copy of Aug/Sept 2013 Mother Earth News magazine, not cover-to-cover like I used to, but just the bits and pieces I have grown to particularly enjoy. I don’t homestead, raise livestock, or grow my own wheat to bake my own bread. It used to be fun to read and daydream about those possibilities, but I have become more realistic about what I can and want to put my time and energy into. I am a busy, ordinary person who likes life that way, but am also concerned about our countrymen’s disassociation from nature, health, and our food supply. 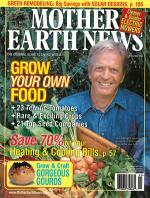 The article that struck me most in this issue was a short letter from the editor, “Why to Support Labeling GM Foods”. The letter is succinct and non-emotional. I appreciated the argument regarding how we expect food labels to tell what what we are eating, from the amount of fat in milk to flavor solutions found in meat. Sometimes the anti-GMO camp is embarrassingly too emotional for my biology teaching-background brain. The use of the term “frankenfood” is a sure-fire way of causing me to doubt the credibility of some anti-GMO articles I have seen. Nonetheless, I am sympathetic to many of the concerns expressed. Labeling GM foods is one of them. The article states that “both benefits and downsides for consumers are controversial”. It refers to the 1992 USFDA ruling that GM foods are “substantially equivalent” to non-GM foods, and therefore require no additional safety testing. (Yikes) The article also refers to studies linking GM food with a host of health difficulties and makes the understated observation that “the science is incomplete”. I agree, although perhaps for more environmental reasons than health. I don’t want GM foods banned as some demand, but I do want transparency in where they are used. I have long wondered why our food industry is so adamantly opposed to such labeling. I have heard the costs of labeling would be prohibitive, but that doesn’t seem logical to me. Labels change constantly just for marketing reasons. How difficult can it be to insert “GM corn syrup” right in between “dextrose” and “monosodium glutamate”?? I, along with most of the people surveyed in the United States, would like to see GM food labeled. Such labeling will not stop me from eating GM food anymore than it stops me from eating artificial flavors and colors. However, I am deeply uncomfortable with the need for our food industry to hide it. What is the issue here? It distresses me that the power behind labeling food resides with powerful corporations. An incredible amount of money was spent to defeat the GMO-labeling 2012 initiative in California. “Big Ag” (as Mother Earth News calls our food industry) spent $44 million while proponents of the labeling law spent only $7.3 million. Yet the initiative failed by only 6% of the vote. Lastly, Mother Earth News states that “nearly half of U.S. states now have mandatory GM labeling on their legislative agendas”. Please look into the why of supporting labeling genetically modified foods. This information should be every bit as available as “contains alkalized cocoa” or “BHT added to packaging material to preserve freshness”. All this lovely rain we have had in SW Ohio in the last week has done quite a number on my garden. The corn looks great and seems to have grown a couple feet in the last few days. My clearance rack marigolds are recovering nicely. Unfortunately, beans and potatoes look a little yellow, and the tomatoes and eggplant are downright wilted and sad. The weeds however, are thriving. Boy, do I have a green thumb when it comes to weeds! We all know it is important to weed one’s garden. Weeds like spurge or any shallow rooted perennial grass must be pulled as they will compete for nutrients and water with the desired plants. Weeds like quack grass can even inhibit garden seed germination. Weeds often grow bigger and faster than food plants and crowd them out of physical space. Weeds look untidy and give the impression of a lazy gardener. So how can one wisely use weeds? Most gardeners either leave the garden soil bare between plants, or cover the ground with mulch. Mulch keeps the soil cooler and more moist than plain dirt. Newspaper used to make a fine cheap mulch, but it is harder to find enough for free these days. I generally buy straw, but I have recently begun using weeds as mulch. I must be careful that newly pulled weeds don’t just re-root where I lay them, though. It helps to lay them out to dry and die a bit first. I also make good and sure there are no weed-seed heads that inadvertently plant more. Weeds work very well as mulch. Weeds can also add nutrients to the soil. How can this be? We pull weeds to keep them from stealing nitrogen from our veggies! Weed mulch, however, will compost directly in the garden bed. This adds nutrients to the soil that previously weren’t available to the vegetable plants. Consider some of the deep tap rooted weeds such as dandelion, lamb’s quarters, and red-rooted pigweed which are commonly found in our community garden. The taproots reach deep into the subsoil in a way that few vegetables can. The roots take up minerals and bring them to the surface of the garden. Pull the weed up and compost it while mulching, right in a garden row. Weeds can also, believe it or not, make good companion plants. 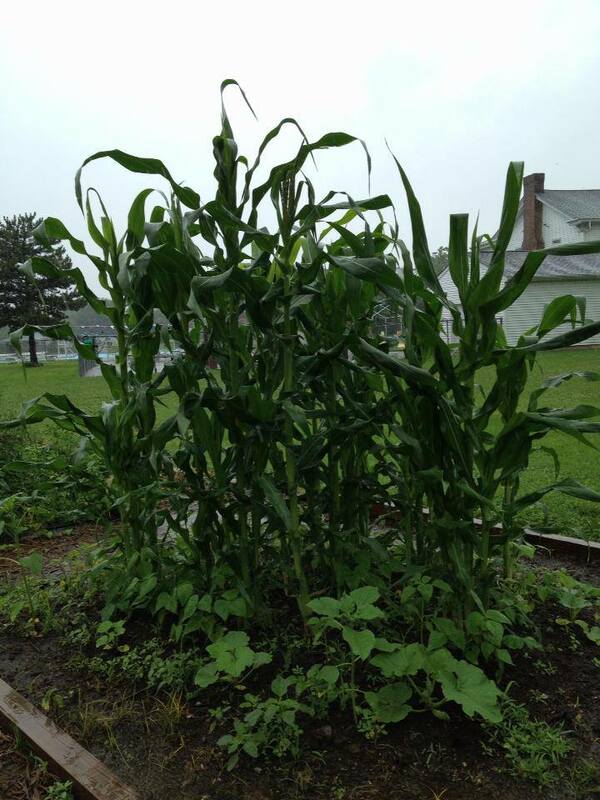 Lamb’s quarter is good for corn. Potatoes like dead nettle. Purslane makes a nice ground cover for corn. Sow thistle, though I don’t use it due to those pesky stickers, is said to aid tomatoes and onions. The mighty pigweed is said to be one of the best weeds for bringing up nutrients from the subsoil, as well as good for potatoes, beans, and onions. However, don’t turn your back on pig weed. It grows very tall and sets a million seeds. Well, ok, the 100,000 produced by one plant certainly seems like a million when they germinate in the garden! I have used weeds as trap crops. The idea is to give insects something good to chew on so they leave your veggies alone. One year, insects chewed the heck out of the pigweed, and I cheered. Two birds with one stone! The insects ignored(almost) my garden plants and put a dent in the weeds! What could be better? Then I went on vacation. A week later I returned to four feet tall pigweed that needed a machete to cut down. If you use pigweed to aid your garden, be wise and keep it thinned. It might be interesting to note that all the weeds listed here are edible. Saute lamb’s quarters like spinach. Eat purslane, also known as “land fish” due to its omega-3 fatty acid content, raw in a salad. Young sow thistles or dandelions are good in salad or sauteed. Dead nettle (called dead because it doesn’t sting) can be eaten in salads, steeped in tea, and used medicinally. Pigweed leaves are a nice edible green even during hot summers, when other greens become bitter. These weeds are all good to harvest as food from a garden. However, keep that trick they have of pulling nutrients up into their leaves and stems in mind when considering them as edibles. Don’t eat them if you find them wild in polluted areas or next to a road. Neither would it be a good idea to harvest these deep rooted weeds from a conventional agriculture farm. High doses of fertilizers and herbicides used render them unsafe to eat. Weeds can take over a garden, look unattractive, and lower food yields. However, used wisely, even weeds can be beneficial to the home gardener. Consider each weed as an individual plant in terms of how it might aid the garden. Use some weeds as mulch. Deep rooted weeds make good compost. Low growing shallow weeds could produce shade for larger plant roots. Some weeds make good companion plants. Some can function as trap crops. Many are edible and considered good eating in spite of our supermarket prejudices. I do not like it when weeds bloom in my garden(too many future seeds! ), but there is a satisfaction in working with nature and using all the plants that grow there. Watermelon is so much more than the quintessential summer picnic food. Originating in African deserts, it has been valued by African and Asian explorers in history as a portable water source. A pretty heavy water source, you might note, if you have ever tried to cart one from the farmer’s market out to the car. Sometimes I miss grocery carts! The heaviness of the melon is a sign of ripeness. Luckily, there are a couple other ways to tell rather than trying to heft all the watermelons in the bin at the store. In the field, a watermelon grows as it lays on one side. That side is greenish or white while growing, but turns a yellowish color when ripe and ready to pick. Many people swear by “thumping”, but I wonder how many watermelons one must thump to be able to use thumping reliably? Watermelon contains an amazing array of nutrients and healthy compounds for a food that seems all water. They are great sources of vitamin A, vitamin C, potassium, and fiber. Red-fleshed watermelons contain the same prostate cancer-fighting and cardiovascular health-supporting lycopene that red tomatoes contain. Also found in watermelon is the good for heart-health amino acid citrulline. Yellow-fleshed watermelons contain more citrulline then their red ripe cousins do, but not as much lycopene. A 2012 study in the Journal of Nutritional Biochemistry reported two groups of mice, both fed a diet high in saturated fat. One group was also fed watermelon juice. The latter group had lower cholesterol and arterial plaque than the control group. Interestingly enough, the mice fed watermelon juice also weighed less. Now, watermelon has always been a good diet food. It makes sense that ingesting anything that contains so much water and fiber could help one lose weight. However, the mice were fed the juice instead of the fruit itself and biochemists are looking more closely into citrulline as a weight loss factor. I might have to look a little more closely into yellow watermelon! Seedless or seeded? Seedless watermelon come from hybrid seed, as obviously they don’t produce seed to perpetuate themselves. The white seed coats found have no viable seed inside. 85% of watermelon grown in the USA are the seedless variety. Frankly, I prefer the seeded melons for both looks and taste. The black or brown seeds are really quite easy to cut/pick out, as they grow in a pattern in the melon and are not distributed willy-nilly. I throw my seeds out, but in some Asian countries the seeds are toasted and enjoyed much as we toast and eat pumpkin seeds here. Growing watermelon in the garden takes a lot of space in a backyard. I am growing an heirloom variety, “Moon and Stars” at present. They seem fairly easy for a novice gardener. Plant a seed, and pouff, a few days later it germinates and begins to grow. (It is a bit of a waste to purchase transplants with such a quick germination time!) If started in a spring garden bed of lettuce and early peas the watermelon vines can take over as the spring things are harvested. Watermelon like long hot summers and deep rich compost. I am a little ambivalent about my plants. Perhaps the space they take up would be better spent on other food producing plants. It might just be a good shopping staple for the Farmer’s Markets. As I’m enjoying eating my garden kale, it struck me that I have never seen Kale bloom. Of course it must flower, but it never makes it that far in my garden. Flowering is called “bolting”, and generally calls a halt to eating that particular green. Bolting means a plant is getting ready to flower and make seeds, resulting in bitter greens. Bolting is frowned upon, but next year I plan to let my kale do just that. It seems kale flowers are tasty! Who knew? The flowers are cut and sauteed in a little olive oil and supposedly taste quite good and sweet. One must be patient, however. 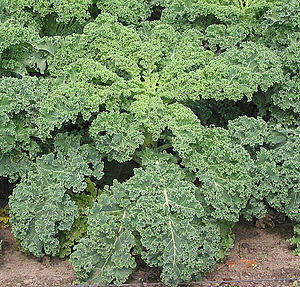 Kale is biennial, meaning it will not flower until its second year. In Ohio, it will need some protection from the worst of the winter to produce these flowers the following spring. Kale is a crop people need to learn to plant. As our food security, or even food stamp security, lessens in the United States, the need to become proficient in basic gardening skills grows. Kale is EASY to grow. Scatter a few seeds in a flower bed and lightly scratch them into the soil. They germinate quickly, and in a surprisingly few weeks one will be able to pick a few leaves from the new plants. They will continue to produce more leaves for further harvests. Unlike lettuce and spinach, kale leaves wash easily, too. A very good plant for a novice or too-busy-to-garden gardener. Kale is nicely cold tolerant, and grows best during the cooler temperatures of spring and fall. In fact, plant a few seeds in late fall. Protect the emerging seedlings with a straw cover and prepare to enjoy an early kale harvest in very early spring. This was an important idea, back in the days before grocery stores. As the root cellar emptied over the course of winter dinners and spring gardens were still several weeks away, people experienced a “hunger gap”. Nutritious early greens like kale played an important part in tiding hungry people over until the garden was back up to speed. Kale is an extremely nutritious food. It contains cancer-fighting and cholesterol-lowering compounds as well as many vitamins, minerals, and fiber. We purchase vitamin pills because why? Kale is a food people need to learn to eat. It can be sauteed like its flowers, steamed, simmered in soups, featured in smoothies, raw in salads, or baked as those fancy little kale chips. Most foods lose a little nutrition when cooked, but kale is such a superfood that the little vitamin A and C lost in cooking still leaves us with more than we need for the day. Even oiled and roasted kale chips are still very healthy snacks. A food dehydrator can turn kale into raw kale chips as available in a grocery store for just a little preparation and a much lower cost. There are many recipes out there, but a sprinkling of sea salt on the leaves is enough to create a great snack. The dehydrator will make prettier, greener chips, but many people have had success dehydrating raw kale chips in their regular oven. Regardless how it is prepared, kale is a plant to learn to grow. It is an easy care plant, and when you grow it yourself you know what pesticides, if any, go into its production and lessen the chance it is contaminated along the food industry chain. The money savings are also nice. Perhaps the most empowering thing is the ability to step, just a little bit, out of commercial food marketing and grocery store dependence. I wasn’t shopping for food plants today. There is a triangular-shapped, shady corner of my backyard that I wish to make wild. Not to leave wild, mind you, but to create a wild space with native plants. The place to go to in Cincinnati for such things is Keystone Flora, off Winton Road. Their hours are limited, but a trip on a Saturday morning is a lovely adventure, http://www.keystoneflora.com. Drive your old car. I will probably not make fritters from my future Elderberry blossoms, nor will I make wine or cough syrup from the berries as some do. Perhaps the birds will be willing to share a few berries with me for tea. I am planting this shrub for them and the other wild things who will appreciate them, after all. However, I am strongly reminded that wild food blooms, too. Grocery store habits die hard. I am becoming more and more discerning about food I buy versus food I grow, but I rarely venture into eating the wild food I see growing. Lamb’s quarters (Goosefoot), pursalane, chickweed, and plantain are easy, tasty, and nutrious greens found commonly in my area. In fact, simply weeding my sugarsnap pea patch would provide enough lamb’s quarters for a spinach-like sauteed side dish with dinner tonight! It doesn’t get more sustainable than Mother Nature making sure these plants survive for us in spite of our constant attempts to eradicate them from lawn and garden. Perhaps we can eradicate the bias in considering “weeds” as food plants. They sure keep trying to get our attention.